Objective: To remind the children that God is Three in One. Aim: to play a game with three balls and one cup before introducing the phrase ‘3 in 1’. You will need: two cups or small buckets, masking tape and at least six ping-pong balls. Divide the children into two groups. Place the cups (or buckets) on the floor or on two low tables. If the cups are on the floor use masking tape to mark an area around each one, approximately 50 x 50 cm. Explain to the children that the aim of the challenge is for each team to get three ping-pong balls into their cup – however before a ball lands in the cup it must first bounce once on the table or in the area marked around the cup. Encourage the children to take it turns trying to bounce their ball into their team's cup. When a child has had their go, whether they were successful or not, play should pass to the next person. As soon as there are three balls in a cup the team scores a point. The cup should then be emptied and play should continue with the next person. At the end of the session the team with more points (i.e. the team that managed to get three balls in the cup more times) is the winning team. You will need: a large sheet of paper or a whiteboard, marker pens, a Bible, sticky tac, the ‘3 in 1’ symbol with descriptions (see Printables) and the ‘Holy Spirit arrow’ (see Printables). Before the session write the verse on the whiteboard or paper. Read the verse aloud and explain that this verse will help us learn more about the Holy Spirit. Underline the reference and remind the children that this verse comes from the book of 2 Corinthians. Underline the phrase ‘the Holy Spirit’. If the children are able to, ask them to tell you two or three things they already know about the Holy Spirit. Show the children a cup with three balls inside. Remind the children that the aim of the game was to try and get three balls into one cup. Ask the children if the numbers ‘3’ and ‘1’ reminds them of anything they have learnt previously about God. Respond positively to the children’s answers. Show the children the ‘3 in 1’ symbol. Stick the symbol next to the verse. Alternatively, draw the symbol on the board. Point to the circle and explain that there are three parts but there is one circle. 1. Point to the three sections of the circle as you explain that the parts of God are in fact called Persons: the Person of the Father, the Person of the Holy Spirit and the Person of the Son whom we also call Jesus. 2. Point to the three sections again as you explain that each of the Persons is fully God. The Father is God, the Holy Spirit is God and Jesus is God. 3. In the circle there are lines between the three Persons but in God the three are so perfectly joined that they are one. There is one God and he is three in one (hold up one finger, then three fingers and then one). If you have time remind the children that we previously learnt that God is good, powerful and wise. Briefly explain that God is fully good; there is no badness in Him. God is all-powerful; there is nothing good and right that he cannot do. God is completely wise; he knows everything there is to know and he always knows what is best for everyone and everything. Spend some time explaining that because each of the Persons of God are fully God, God the Father is good, powerful and wise, Jesus is good, powerful and wise and the Holy Spirit is good, powerful and wise. 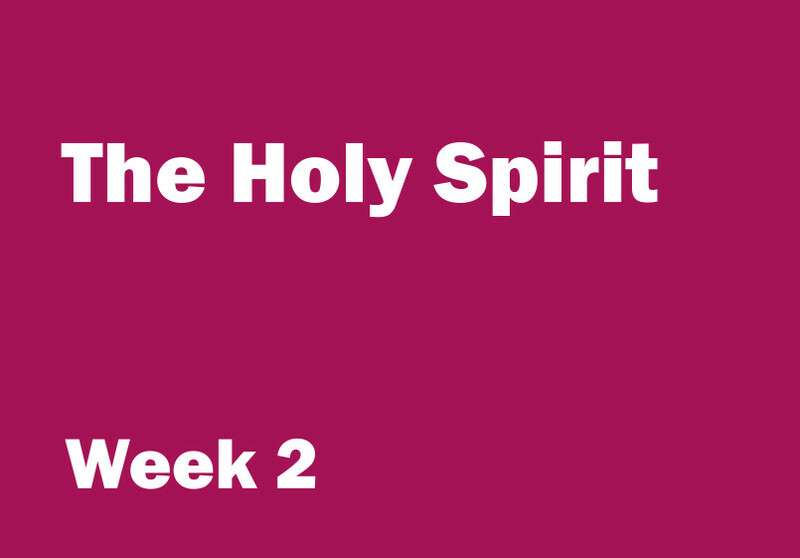 Explain that next week we will talk more about the Holy Spirit coming down to be with people. To the tune ‘Oh My Darling, Clementine’ (‘Found a Peanut’). Be with each of you today. If you have more than six children you could divide them into three groups, allocate one of the first three verses to each of the groups and encourage them to sing all the verses at once. Finish with everyone singing verse four together.